carved in three-quarter relief with a figure of the Buddha Shakyamuni seated tranquilly with legs crossed in padmasana (lotus posture) and hands held open in abhaya (absence of fear) and varada (charity) mudras, wearing loose robes falling in pleated folds and extending over the edge of the block-form base, flanked by a pair of crowned bodhisattvas carved in smaller scale, shown standing on lotus-petal plinths, all backed by a gently curved petal-shaped mandorla carved in relief with a halo of lotus petals behind the Buddha’s head encircled by floral vine scroll below a wide border of rising flame motifs, the front of the base with two lions flanking a tall incense burner, all carved in relief, the yellowish conglomerate stone (huang hua shi) with remains of original red pigment on the mandorla and black pigment on the hair and faces of the Buddha and bodhisattvas, a dedicatory inscription of fifty-two characters carved on three sides of the base. 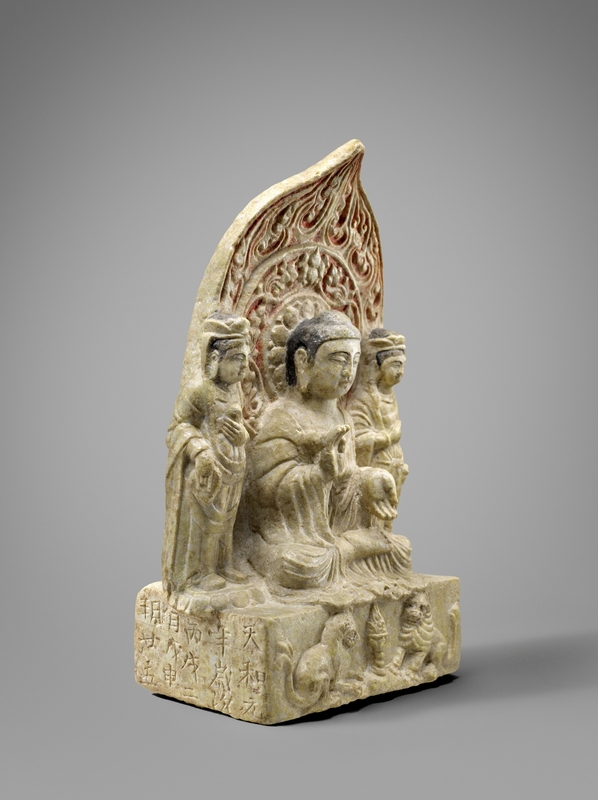 Compare the Northern Zhou stone Buddhist triad dated by inscription to the second year of Tianhe (A.D. 567) unearthed at Xi’an in 1974, illustrated by Juliano in the catalogue of the China Institute exhibition Buddhist Sculpture from China: Selections from the Xi’an Beilin Museum, Fifth through Ninth Centuries, New York, 2007, pp. 54-55, no. 11. 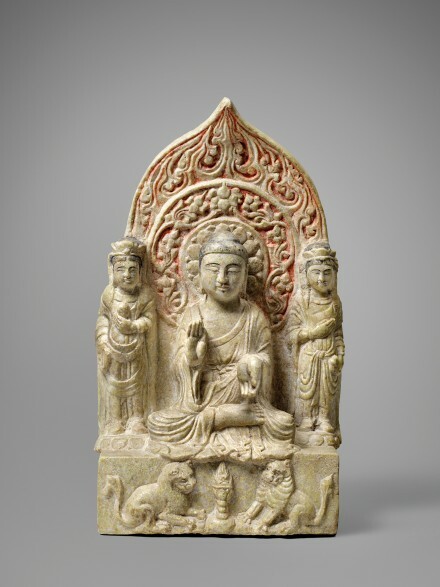 Compare also the Northern Zhou stone Buddhist triad with a pair of lions flanking a tall incense burner at the base, in the collection of the Kyoto National Museum, illustrated by Matsubara in Chūgoku bukkyō chokoku shiron (History of Chinese Buddhist Sculpture), Tokyo, 1995, Vol. II, pl. 355a.